A deepening of the navigation channel in the Chelsea River in East Boston caused the WMRA to rquire a new siphon and to procure the installation of an 1,100 feet long 48"ductile iron pressure water pipe inside a 72" Permaloc® casing jacked by Microtunneling between slurry wall shafts with a floor 90 feet below ground surface. The alignment started and finished in a silty till while under the river bed a thick gravel layer could put the river in communication with the bore. After difficulties of all kinds the contractor faced the prospect of having to breakthrough the reception shaft slurry wall without a seal, the precise location of the break through being too vague to have one installed. The problem was the 85 feet of head from the Chelsea River having access to the bore annular space representing the risk of channeling and flooding the reception shaft. Being called in by the contractor, we proposed and implemented a solution that created and maintained an active filter cake plug, 100 feet back from the reception shaft. The self-hardening slurry was a modified IMPERMIX® tuned not to set for 4 days; while the rest of the pipe was lubricated with a WONDER MUD®/bentonite mix, the grout was pumped through the lubrication express line to the head. Constant slow pumping provided counter pressure and the resulting cake formed an effective packer. 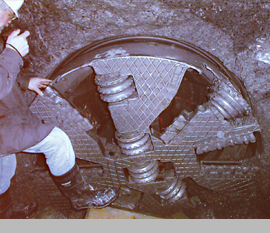 As seen in the picture, the annulus did not allow any water in during and after breakthrough. The process was continued until the machine was out of the shaft and the Permaloc® pipe pushed to its final location at which point the gap between pipe and concrete wall was plugged with hydraulic cement. This "first" was successful thanks to the practice of the Observation Method, where soil conditions, grout formulations, equipment selection and controls are evaluated in real time by an experienced practitioner. Incidentally, the space between the water pipe and the Permaloc® pipe was eventually filled with an IMPERMIX® formulation from the launch shaft in a single phase.